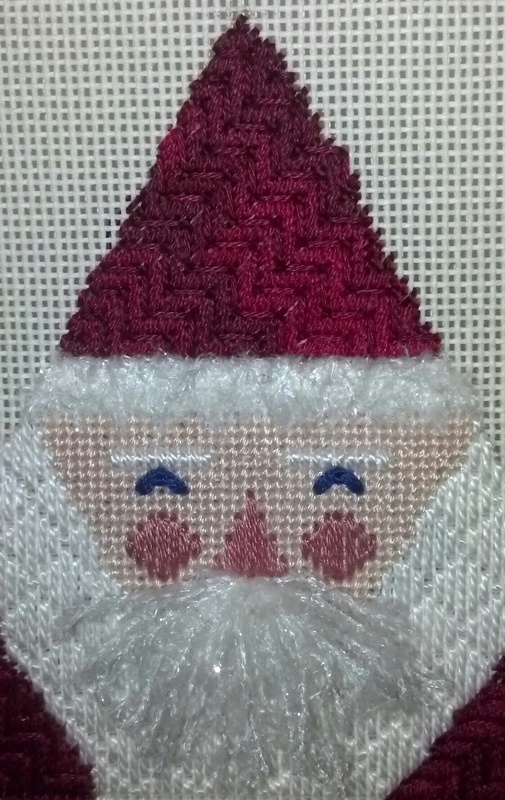 This Snow Globe Santa by Janet Casey Ziegler was stitched by Linda from my ANG Main Line Stitchers chapter. I was thrilled when she gave it to me last Christmas but I forgot to place it on my blog. So, here it is for posting this Christmas! And, I was just as happy to get a Christmas Basket this year from Linda. Yes, she’s also a beautiful sewer. I did make pillowcases for a charity, Ryan’s Cases for Smiles, earlier this year. Linda helped me with them too because it had been 40 years since I’d used a sewing machine. The two we made are in the upper left corner of the picture. Then, I made 2 more at our Community Day at work using a regular machine and a surger. It was fun. One of the women in my group enjoyed the event so much that she is getting a sewing machine for Christmas. Linda kept her eyes open for sales & found a great deal from Steve’s in King of Prussia, the Anna model, half off for just $200 and a great machine for a beginner. It almost makes me want to take up sewing!! But, I have tons of needlepoint projects started and ideas of my own that I want to work on and 3 big events with classes coming in 2017. Linda and I are both attending Blue Bonnet for Toni Gerdes’ classes Fire & Ice and Bronze Purse in February and Nashville Needleworks in April with Laura Taylor for Embracing Horses. Then, I will take a 4-day canvas embellishment class at ANG Seminar in Anaheim with Cynthia Thomas after taking her Creating Diagrams and Stitch Guides using Microsoft Office class. I didn’t forget about my husband, Bill. We’re extending each trip to take in local sites. And, we have a non-needlepoint train trip across Canada planned for July-August (actually, I will stitch but no classes). We’ll be married 30 years in Oct 2017 – lots of fun times ahead! 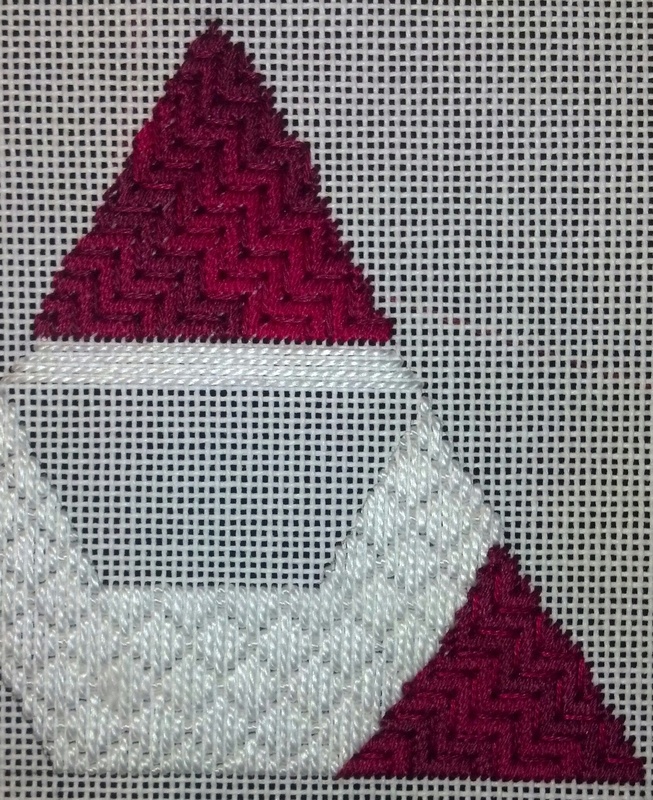 The instructions of Peg Dunayer’s Triangle Santa ornament called for a satin stitch for the hat trim but the picture used a more decorative stitch. 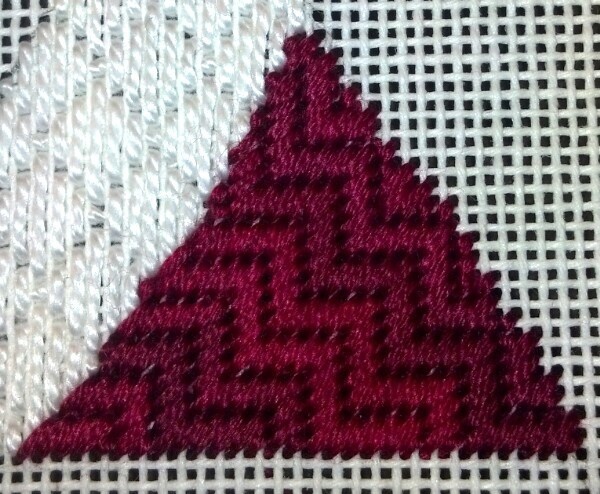 I decided to try a new stitch after thumbing through Stitches To Go by Suzanne Howren and Beth Robertson. It is the Triple Cross Stitch done over 4 threads wide as shown in the diagram but vertically over 5 threads. As you may have noticed in the last posting, I layer some threads to give the trim some height. And, thanks to the stitch, it created a layered effect. It is also non-directional and filled the space up fully. And, rather than leaving the threads of the mustache in a figure 8 as shown, I cut the ends. I also layed a thread below the satin stitch for the eyebrows for some height. Now, I’m ready for our September class at Keystone when we learn some finishing techniques and do some braid making! I couldn’t decide on Cherry Wine or Claret for the red overdyed thread from my stash. So, I put both in the project bag. When I stitched the hat, I decided the lighter Cherry Wine would be better & thought 3 threads provided enough coverage on the 18 count canvas. Then, I stitched the beard and layed a few base stitches to give the brim of the hat some depth. I am probably going to do a different stitch than the satin stitch that is suggested but am still thinking. Any suggestions anyone would like to offer? When I went back in my bag to get thread for the shoulder, I grabbed the darker Claret quite by accident. And, I saw a note that 4 threads are recommended for use on 18 count. In the meantime, I’d seen an article on “dandruff” and decided this was an example of that. You can see the hat has speckles of white canvas showing through but the shoulder has almost none. 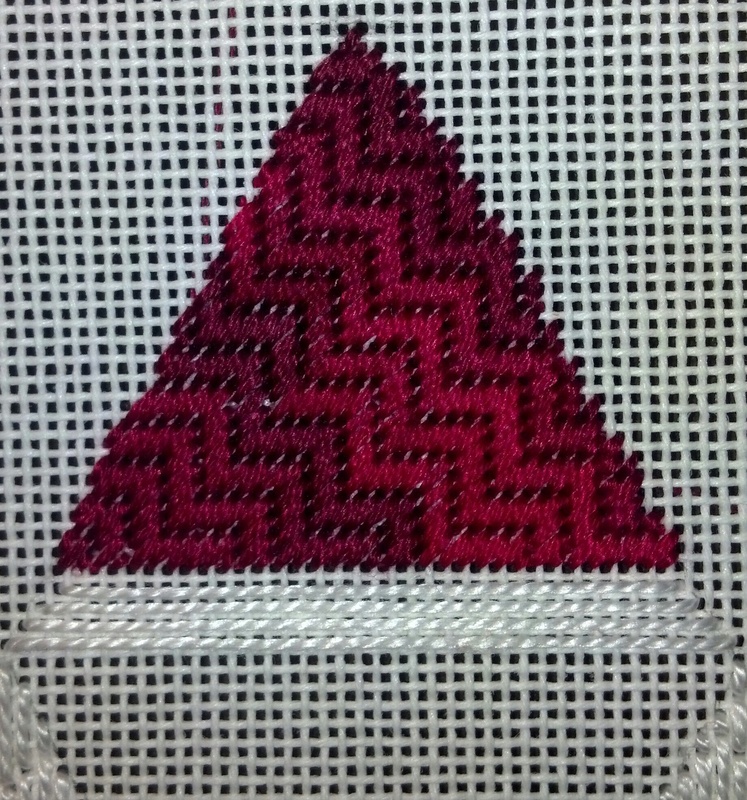 So, I went back to the hat and added 2 threads of the darker Claret on the hat outlining the Byzantine stitch. Then, to lighten up the shoulders, I outlined them with 2 threads of the lighter Cherry Wine. A definite improvement and lesson learned about thread coverage.